Hey there Peeps! I am all up in the holiday flower making and having sooo much fun. This card mixes a few blooms from Floral Bouquet and a few Sweet Christine accented with blingy centers and glitter glues. I utilized the centers from the Sweet Christine and finished them off with silver embossing powder to create a star effect. Hey there Paper Peeps! Today I am celebrating one of my favorite times of year. Which of course is Fall. In Michigan we enjoy glorious foliage and cool crisp air. Also everything is pumpkin spice so that’s a win win. 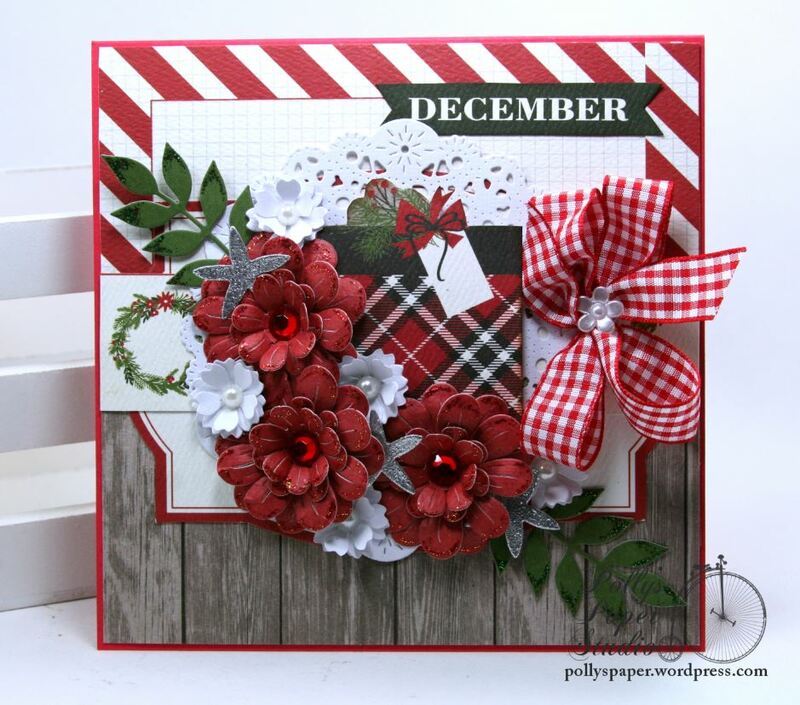 I’ve created a tag and card using the gorgeous blooms from Petaloo and just perfect seasonal patterned papers from Authentique. I’m also incorporating some yummy mixed media supplies to alter metals and chipboard pieces to coordinate with warm and rich patterns of the papers. The burlap from the Daisy Layers adds a wonderful textural element and creates a nice base layer for the more dimensional flowers. To balance the arrangement I added a few more of the layers to the top just tucked under the chipboard frame. The larger Blooms are the centerpiece for this arrangement with a few Spring Berries , twine and altered die cut shapes. This tag would make a lovely home décor element displayed on a mantle or shelf with a few pinecones and pumpkins. I’ve layered the papers here with the sweetest image of a vintage girl harvesting wheat. This was the inspiration to choose the flowers to coordinate with the rich patterns and warm colors. The key to this arrangement was mixing textures, styles, and trims. More flowers here mixed with metal embellishments and fussy cut images that have been accented with mixed media supplies. I really had such a lovely time creating this set of Fall projects tucked away in my shop with classic radio programs and little space heater. Hey there Peeps! Hope your Thursday is off to a great start. Mine is because I get to share this fun tag I created with the new paper I received in my totally awesome DT box from BoBunny. When I tell you I super love the new collections…it is no joke! So many great new patterns I am swooning. So I’ve made 2 projects already and this Making Memories Tag is the first one I’m sharing…. I can totally see this hanging in a retro or vintage inspired kitchen : ) It’s so bright and cheery and full of yummy layers of papers and altered metal and pins and pretty flowers. Really Reasonable Ribbon Supplies~ Robin Egg Satin with Stitched Center, Sheer Cherry Red. 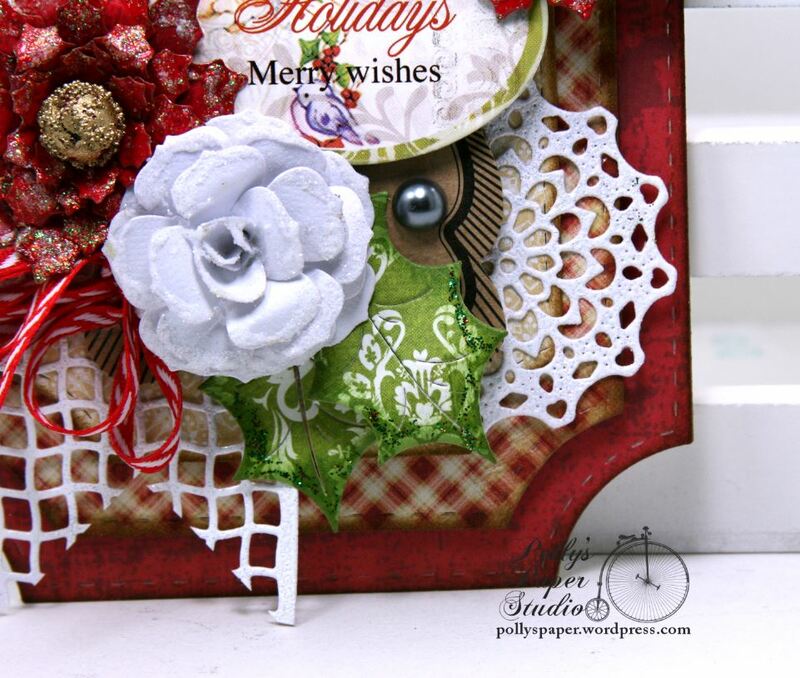 Cheery Lynn Designs Supplies~ English Tea Party Doily, Flourish #14. Hey there Peeps! Just dropping in for a quick share. 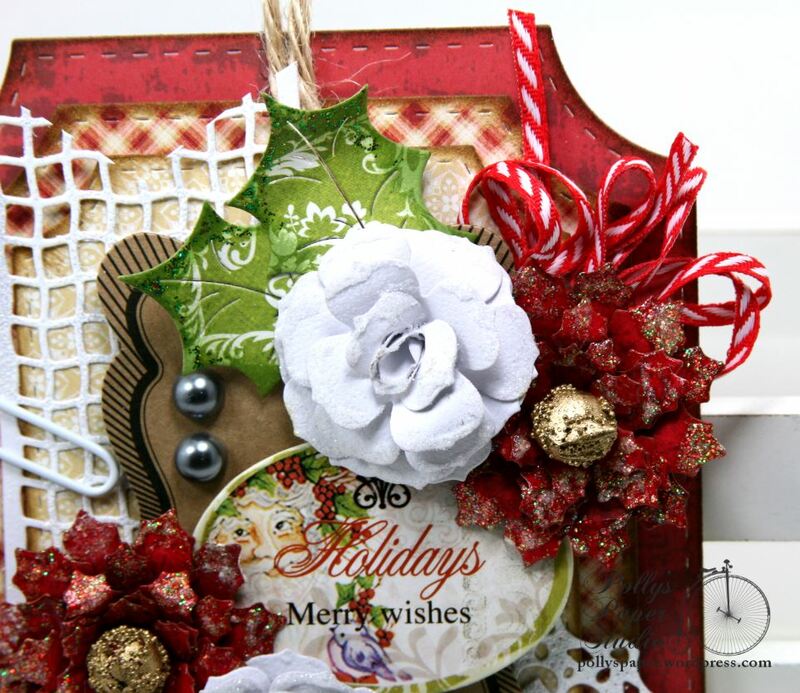 I created this greeting card and tag set with the Merry & Bright collection and the Selfie Dies. 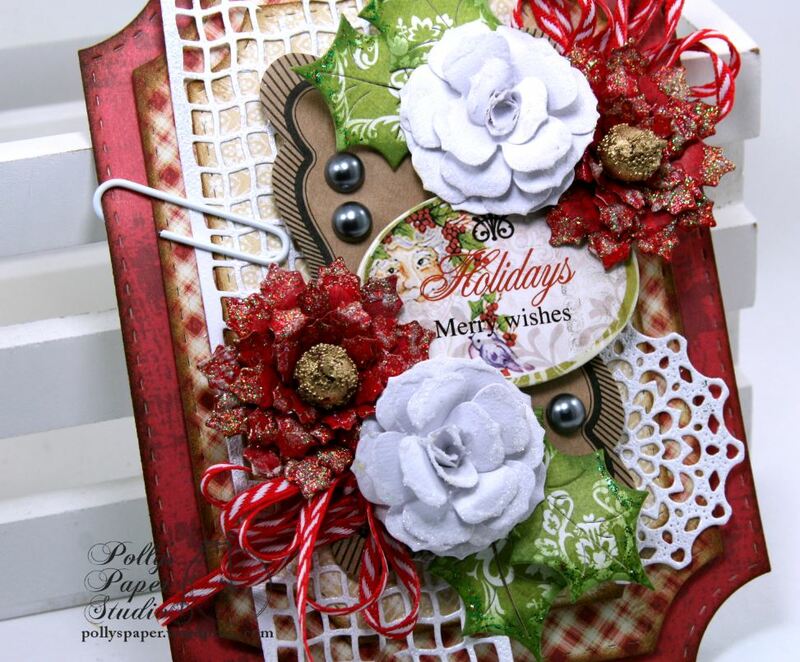 I layered the patterned papers with the dies cuts and accented them with festive twine, tiny clothespins and snowflakes topped with Double Dot Tuxedo Jewels Pearls. 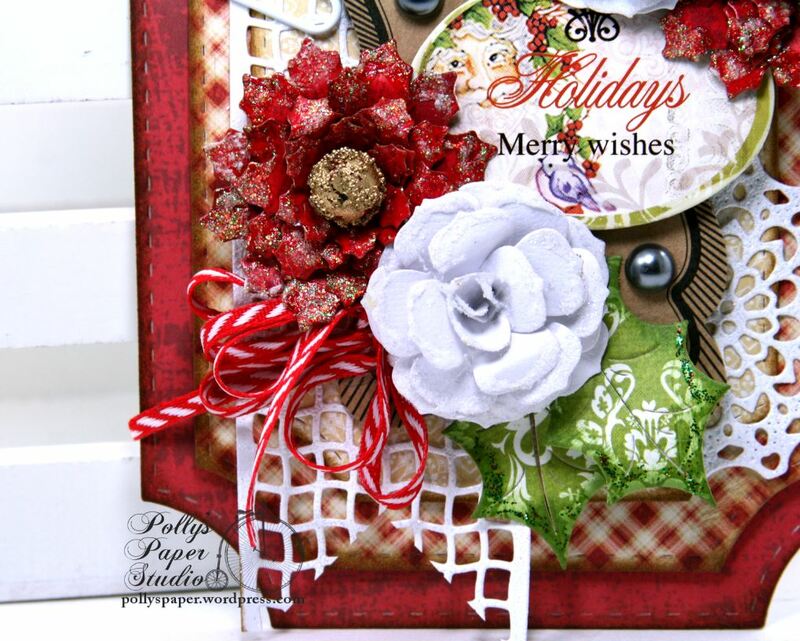 Last but not least a bow and novelty poinsettia button. Hey there Peeps. 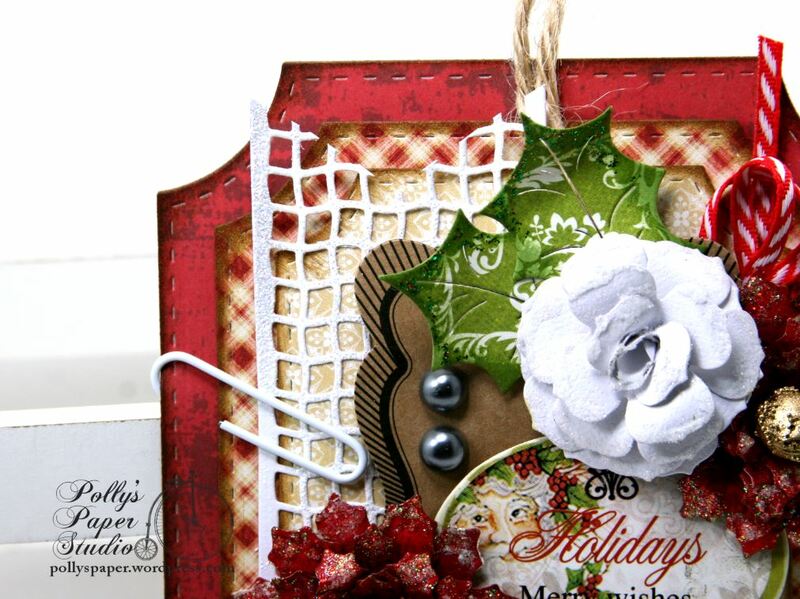 Ginny here to share a very festive Christmas Tag I created with many of my favorite Cheery Lynn Designs Dies and some fun patterned papers and embellishments. I created the base for this tag with the Coved Rectangle Stitch and Cut die using the middle size to cut 1 from 110lb cardstock and 1 from red cardstock. I adhered these together to make a sturdy layer to add the rest of the sections. Using the next size down in the set of Coved Rectangles I cut a layer from red checked paper and attached it with spacers between. To add texture and detail I tucked in a section of Gauze Border that I snipped to fit and dovetailed. It’s held on with glue and a funky giant paper clip. Christmas flowers are the funnest to make and these were a (slightly messy) blast. 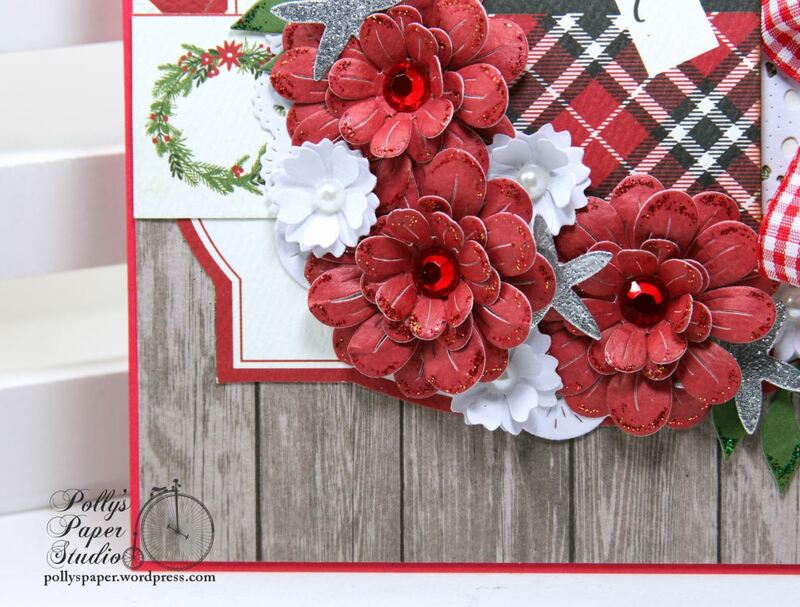 I created the Poinsettia with matching red cardstock and accented the tips with Sugar Glitter Paste before assembling. The center is pieces clipped from a berry pick and given a light coat of alcohol ink to color it to coordinate. The white flower is the Gardenia cut with crisp white. Every flower arrangement needs leaves so why not use Holly shaped leaves with a little inking on the edge and Stickles to make it extra festive? 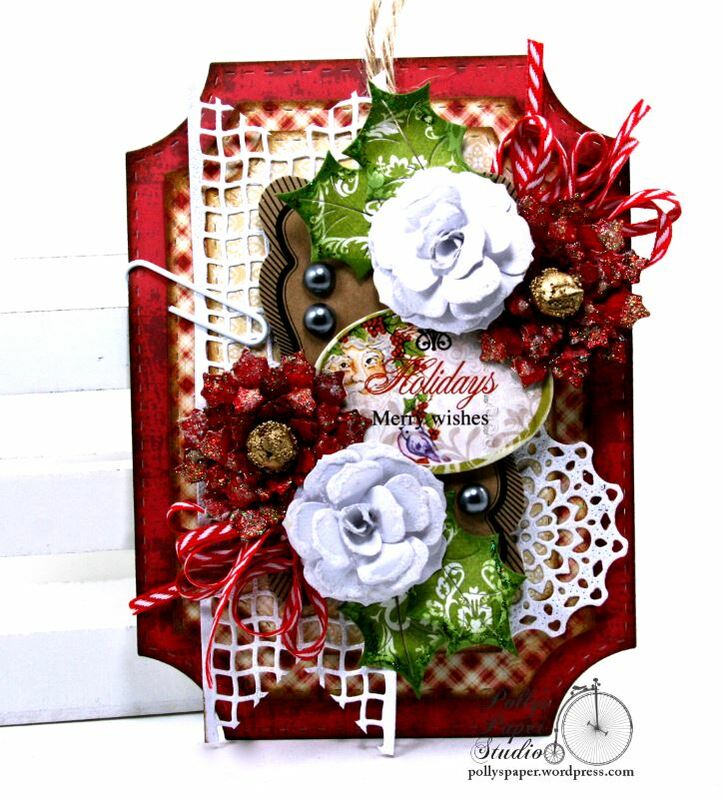 A few last details like this Tiny Kaleidoscope Doily , chipboard sentiment and pearly accents are perfect for this tag and finished off with some snappy red and white stitched ribbon. Hey there Peeps! Ginny here dropping in to share a greeting card I made with loads of mixed media supplies and a digital image from my shop. The bird in the images was the inspiration for the card. The bright feathers and flowers steered me towards choosing lighter colors with not too much contrast so as not to be too busy. Instead I’m using texture to create detail. Polly’s Paper Studio Supplies~ Inspire Bird Mixed Media Greeting Card, Bird Frame Collage Sheet. Gypsy Soul laser Cut Supplies~ Words & Phrases 1, Filigree Frames Shapes Set. Really Reasonable Ribbon Supplies~ Robin Egg Satin w/ Center Stitch, Spiral Stamens, Ivory Burlap String. Hey there Peeps! Just a quick post today. Sharing my Social Media project for BoBunny this week. I created a wall hanging with the Sweet Moments Collection. This wall hanging is created with layers of patterned papers from the Sweet Moments Collection with Noteworthy elements fussy cut and added with spacers for depth. Several dies ( Elegant Border, Ornate Doilies, Selfie) are tucked in here and there as well as Frosting Jewels and Double Dot Think Pink Jewels for accent. The base of this wall hanging is sturdy chipboard with a generous length of coordinating ribbon trim to hang.